Each year 50 million people go to war. The enemy? ALLERGENS. The human body will defend itself from these attacks. Dust, mold, and pollen wage war by eliciting unpleasant reactions within the body. Allergy victims suffer through watery eyes, sneezing, headaches, congestion and more. One of the marvels of the human body is that it defends itself against invaders. These are things such as viruses or bacteria. Our bodies react to harmless substances such as dust, mold or pollen by producing an antibody called immunoglobulin E (IgE). We may experience an exaggerated reaction to a harmless substance in the environment. 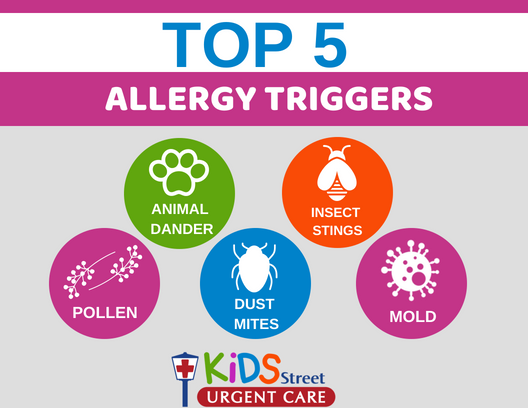 Allergies are triggered by mold, tree, grass, and weed pollen. All of these allergens rear their heads during the springtime and continue through the early summer. An allergic reaction occurs anywhere in the body, but usually appears in the skin, eyes, lining of the stomach, nose, sinuses, throat, and lungs. Allergy symptoms include a runny or stuffy nose, headaches, fatigue, rashes, fevers, shortness of breath, coughing, sneezing, and nausea. How can KidsStreet Urgent Care and MainStreet Family Urgent Care help? Many of these symptoms can be treated after being evaluated by a KidsStreet Urgent Care pediatrician or a MainStreet Family Urgent Care provider who can then decide the best way to treat those symptoms and get you back to enjoying the warm weather! Treatment options include nasal corticosteroids, injected corticosteroids or extra-strength allergy pills, some of which can be purchased on-site with MainStreet’s Pre-Pak pharmacy which eliminates the need for an extra trip to their pharmacy. Visit KidsStreet Urgent Care or MainStreet Family Urgent Care, open seven days a week with extended hours, to help you Feel Better, FAST! For more information, visit www.mainstreetfamilycare.com, www.kidsstreeturgentcare.com or e-mail info@mainstreetfamilycare.com.